British Airways expects to carry up to 70 percent of passengers during a series of strikes by cabin crew during May and June. London, England (CNN) -- Now that a planned cabin crew strike against British Airways is under way for the May 24-29 period, what should you do if you're holding a BA ticket and planning to fly? What is BA's flight schedule for the strike period? BA says that it has confirmed its flight schedule up to and including May 29 "for all flights for London Heathrow." 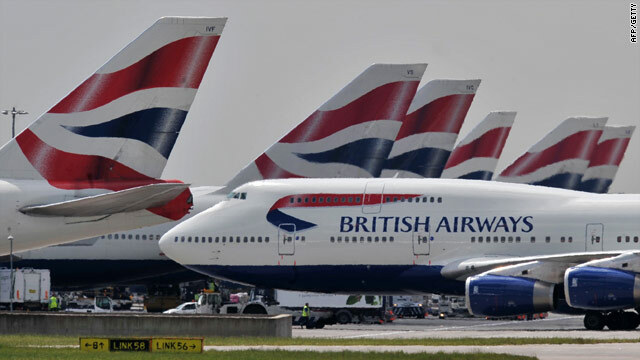 BA advises customers to check its Web site: BritishAirways.com. Passengers are advised to use their reference number to check if their flight has been cancelled. BA says that it is also informing customers via text and email. How many flights will be cancelled? This depends on the number of crew who ultimately strike and how well BA's contingency plans work, but a BA spokesman told CNN that it expects to carry about 70 percent of booked passengers during May 24-29. What if I am flying from Gatwick or London City airport. These airports are unaffected says BA, all their flights from Gatwick and London City will fly at their scheduled times. If your flight is cancelled? You can rebook onto another British Airways flight on the same route at no extra charge, subject to certain time limitations (check the BA Web site). You can also rebook onto another BA flight from another airport, although the airline will not cover expenses to the alternative airport. You can also rebook onto an agreed alternative airline, subject to availability. You also have the option of canceling your booking and obtaining a refund. What if I cancel my original booking but then want to rebook on the same flight? You can try and rebook on the same flight, although BA said it will treat such bookings as new, and they will be subject to availability. Will flights be disrupted outside the scheduled flight dates? BA has published a proposed flight schedule for dates between anticipated strike dates. It says it will issue a list on Wednesday 26 May "for flights to and from London Heathrow between 30 May and 4 June." If you are thinking of booking flights with another airline, keep in mind that BA is not be obliged to refund your money, if the strike is called off and it can operate the flight as planned, warns the Air Transport Users' Council, Britain's consumer watchdog for the aviation industry. BA will provide hotel accommodation to passengers stranded abroad because of the strikes. A BA spokesman was unsure if other expenses, such as food and drink, occurred during their enforced stay would be covered, although he suggested passengers could put in claims for "ancillary costs" with either BA or their insurance company. How can my insurance help? Cover provided by insurance policies vary, and passengers should check with their insurance providers, according to Rochelle Turner, a researcher at Which?, an independent consumer magazine. Those who booked their flight using a credit card may be entitled to recover at least some of the costs, she said.